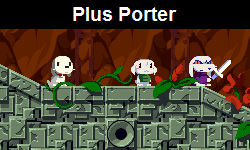 What are you're favorite official art styles for Cave Story? What are your favorite CS styles? In particular what are your favorite looks for Quote and Curly and what do you think of the designs for Quote and Curly in Blade Strangers? I really like the BS designs but I've also always loved the the "Mr. Traveler" look from the Wiiware version and especially all of the art by Zanpan. Obviously Pixel's art is great too but not my favorite, but as far as Quote goes I've always liked his non update Sue-like face sprite (not really into the updated version with the face lines). I personally hate the Cave Story 3D art. Those are the only styles I can remember off the top of my head. Hmm, does the Nicalis 2x resolution art style count? I suppose that would fall under "Pixel's art" or "Other." Nicalis's enhancement on Pixel's art is definitely my favorite style of the different ones I've seen. Cave Story's original art style fits the game very well, and the improved art style feels very natural to me and looks great. Blade Strangers would probably be my second favorite, I guess? They're decently well-made renditions of the characters that have that realistic look to them, which is nice. No complaints. Cave Story 3D's art style is inoffensive, but perhaps too chibi for my liking? I think it probably could have been handled a bit better, especially in-game. I had to do a Google search for Zanpan's art, but I definitely recognized it when I saw it. It looks good as stylized fan/promo art, but I don't think I'd want any official game to look like that. Technically, Zanpan made art for the Japanese release of Cave Story 3D, though I do wonder who drew the original Quote artwork from the Wiiware version? Blade Strangers would probably be my second favorite, I guess? They're decently well-made renditions of the characters that have that realistic look to them, which is nice. No complaints. I'd say that counts. I definitely agree it seems like a natural progression from the original look to the game and I personally prefer it to the original. I think maybe what I really like about the look of the BS designs just how good they look in motion to me, it might also be that for some reason they just feel like they fit. If someone told me that those were official designs for non chibi looking Quote and Curly even before BS was announced I'd still believe it (which they technically were since they were made for CSDSi), and I'd believe it more easily than most realistic looking designs (not that I don't like that kind of fan art, they just tend to not look official to me). I'm definitely a 2x graphics kinda guy, the rest of the art styles minus pixel's don't really entice me all too much. I was never a fan of CS3D's art, it just never sat with me right, zan pan's does more, but I like the 2x res art/pixel's art best; it's my safe zones and what I know best. I wouldn't know who made the Wii pic, but I'd like to know too since I do like that drawing. I think I do remember an interview with Pixel where he talked about how he was worried about the new art but ended up really liking it, so I think someone else did it yeah. I like Pixel's original credit art images the best, as well as the 2x resolution enhanced counterparts in NICALiS' ports. I also really like the original Wiiware promotional art. The Cave Story 3D Japanese art is pretty good too. I like these the best because they depict Quote and Curly as closely resembling prepubescent boys and girls like they should, without the lines on their faces, and with proper, realistic body proportions. This is why I don't like the American Cave Story 3D artwork that gives Quote the body proportions of his game play sprite, and I really don't like fan art that depicts Quote and Curly as teenagers, or even worse, young adults. 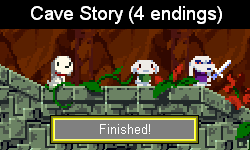 The main pieces that come to mind are the cover art for the Cave Story Remix Project. To clarify, I can still enjoy these works of art from an artistic standpoint, I just find them to be very inaccurate depictions of these characters. Location: USA, not gonna go into details. I personally like the Zanpan style the best because it represents the characters well, despite being very different from Pixel's art.